Laser cutting is a precision manufacturing process that can be used to cut metals and a variety of other manufacturing materials. The process utilizes a high-powered beam, also known as a laser, in order to cut the intended material. The beam is created through the process of an external source exciting electrons within an optical resonating chamber. These excited electrons then emit photons (light) that are reflected back and forth within the optical resonator, amplifying the light through further stimulation. When the photons emerge from the laser, they do so as a very small, highly concentrated beam of light, known as a laser beam. The beam path is controlled by computer parameters, and is so powerful that everything in its path is vaporized, burned, or melted. This process creates a precise cut. The precision and small turnaround times associated with laser die cutting often make it an efficient, cost-effective manufacturing option. At American Industrial Company, we now offer our customers the unparalleled benefits of custom laser cutting with our brand-new Vytek FiberCAB44 laser cutting system. The FiberCAB44 provides high accuracy cutting and etching with low downtimes. It is one of the most advanced precision laser cutting systems currently on the market. The FiberCAB44 laser cutting equipment uses fiber optic technology to focus its laser beam, which results in amplified beam strength and reduced spot size, producing even better precision and cleaner cut edges. On American Industrial Company’s laser cutting system, tolerances as small as ±0.002” can be easily achieved. Typical applications include cutting sheet metal, flat blanks, formed parts, and stencils and signs. The precision and speed of this system, especially on thin materials, dramatically decreases lead times and reduces material scrap. The laser cutting capabilities at American Industrial Company provide our customers with efficiency and low cost, high quality products. American Industrial Company strives to serve the following industries by providing precision laser cutting services for: appliance, automotive, construction, dental, electrical, fastening, furniture, government and defense, hardware, heating and cooling, industrial, insert mold, lighting, marine, medical, power tools, solar and green buildings, and sporting goods. All runs are monitored and inspected to verify that products are produced according to specification. Monitoring and inspection methods include statistical process control (SPC), advanced metrology tracking systems, and visual measurement tools. At American Industrial Company, we strive to provide the highest quality products for our customers. Our facility is ISO 9001:2015 certified and our testing methods including non-destructive, destructive, and hardness testing. AIC also provides customers with complete and detailed documentation, including inspection reports. Our laser cutting services provide precise, quality parts with short lead times and competitive pricing. 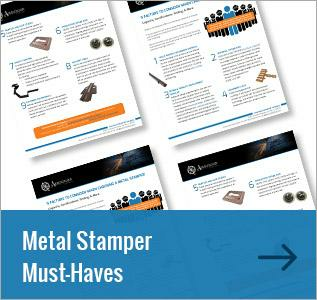 To learn more about our exceptional laser cutting services, download our eBook, The Benefits of Laser Cutting in Metal Stamping.